This week on Childrens Hospital, everyone is suddenly married. Don’t ask questions, guys! It’s all going to make sense, we promise! To open the episode, Cat tells a shrieking Glenn and Owen that she’s getting married and we cut to her parents’ country house (conveniently located in Japan) and, in the best and cleverest surprise of the episode, everyone’s cars start pulling up and brand-new couples start stepping out. Glenn is now married to a lady called Sheri who won’t stop furiously ranting at him in sign language. Owen has Carla Gallo in tow (nice work, Owen!). Valerie is dating “Weird Al” Yankovic, played, of course, by Judah Friedlander. Lola’s husband is the never not funny Richard Kind, who is always seen ranting into a cellphone. It’s a thousand clichés rolled into one twenty-second scene and Childrens Hospital, as always, doesn’t care if this doesn’t make any sense to you yet. They have ten minutes to make everything make sense, and dammit, they’re gonna pull it off. 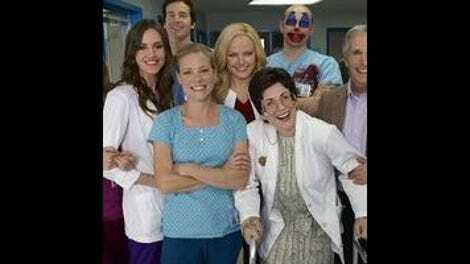 What I love about episodes like this (but really, pretty much every Childrens Hospital) is that they introduce a thousand weird elements for the show to deal with and manage to tie up every loose end, even if their solutions are often ridiculous. So not only does everyone have a previously unseen spouse or significant other, but all of those relationships need to be destroyed within ten minutes. Glenn’s wife is the first to die, murdered at his hand with a cheese knife because she won’t stop signing angrily at him. Owen quickly takes control of the murder investigation but I almost expected that to never get resolved, since there’s so much more to get to. What a fool I am. Haven’t I been watching this show for five years now? Glenn cops to the murder a while after Owen botches his first accusation (Cat, because the knife was bought at “a department store”) but gets off the hook on a friend technicality (Blake, in his only line of the night, poses the question “What about Shari's friends and parents?” but is rightly ignored). How does everything else get ruined? Well, turns out Lola knew Cat’s fiancé Michael (Justin Kirk) back in college (when he was played by who else but…“Weird Al” Yankovic) so that happens, then Michael ends up with Cat’s white housekeeper, Richard Kind and Carla Gallo get together…it’s beautiful to watch it all happen, even with no foreshadowing. A bunch of characters we’ve only known for a few minutes magically seeing their storylines dovetail together is just as perfect as anything anyone’s ever done on Seinfeld. Probably. “Country Weekend” is also really funny—it crams in a ton of great weird jokes and lines even though it has to spend a lot of time establishing all its bizarre new characters. It also found an inventive new way to use the revolving door of guest stars who are flocking to the show these days—draw as much attention to their stunt casting as possible, then it won’t seem like stunt casting at all.